A man feared dead after spending two days and nights on the banks of a Borders burn is recovering in hospital after being treated by a search and rescue team. The 73-year-old man was discovered with his faithful terrier by his side after having been reported missing by his family when he failed to return home in foul weather. After two nights in the open in appalling conditions, his family had begun to fear the worst for the Eyemouth man. Border Search and Rescue Unit was alerted on Sunday morning. By that time he had already been out in the open for 48 hours. A search and rescue unit spokesperson said: “He was last seen in Coldingham on Friday morning, where he picked up his daily newspaper. “Having failed to attend an appointment later that day, he was missed by his family on the Saturday and reported missing on Saturday evening. Searches through Saturday night failed to locate him, and by the time Border Search and Rescue was called in on Sunday morning, hopes for his survival were slim. “After several days of heavy rain, local burns were in spate, and the fear was that he had fallen into a waterway. “Within an hour of the deployment of 18 members of the team, the casualty was found by a local farmer, still alive but only just, having fallen into a gully and come to rest on a fence, which prevented his falling further into the burn and almost certainly saved his life. The team spokesperson said the man was deeply hypothermic and unconscious, and required urgent medical attention which two team members provided. The immediate life-saving first aid was followed by an evacuation from his precarious position to a waiting ambulance, which took him to the Edinburgh Royal Infirmary. 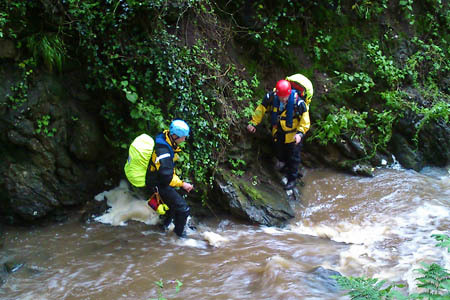 BSARU team leader Seymour Haugh was delighted that a life had been saved. “The fact that he had been missing, along with his dog, for 48 hours, during which the weather had been pretty unrelentingly foul made the family and everyone involved in the search fear the worst,” he said. “That he was found alive is testament to his tenacity. We have seen previous cases where the close proximity of a casualty’s dog has helped to maintain body temperature, and this may well hold true in this instance. “The team was actually assembling for a training exercise near Kelso when the call went out, and the fact that we had 18 personnel already in transit and able to divert to Eyemouth was a stroke of luck. The man’s condition started to improve slowly, and there are hopeful signs that he will make a satisfactory recovery. The Kelso-based Border Search and Rescue Unit provides mountain rescue cover in the South-East of Scotland and is affiliated to the Mountain Rescue Committee of Scotland.